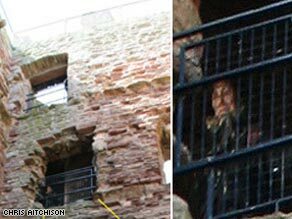 (CNN) -- The figure peers down silently from an upper floor of the ruins of a Scottish castle, wearing what looks like an outfit from the Middle Ages. Could this be a long-dead Scottish earl, or just a random, modern-day visitor? But the "ghost" in the Scottish castle has generated the most attention. What do you think about the image? A similar mystery happened five years ago at another medieval site, Hampton Court Palace, built by King Henry VIII west of London. A security camera captured a figure in period dress opening a window, peering out, then closing it again. Palace officials insisted at the time that no one was in the room, and they were at a loss to explain the figure. It later emerged that a member of staff wearing a medieval costume was the person in the video. 5 Worst year for measles since 1996? 1 Don't waste money on your wedding!